Michael Daniel Ho - The Wildlife Ho-tographer: How Does Canon's Image Stabilization Technology Work? How Does Canon's Image Stabilization Technology Work? 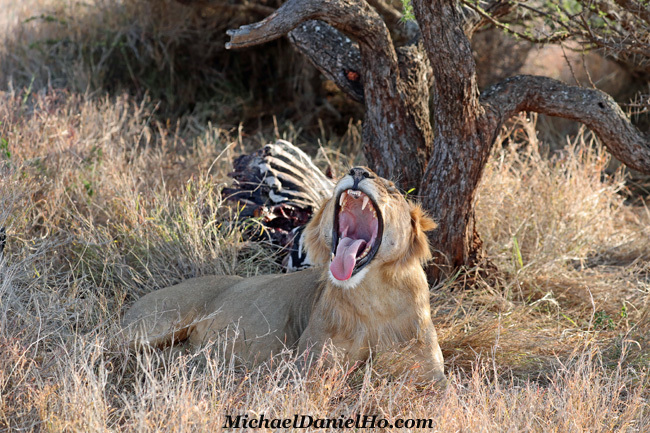 I am back after a rather successful East Africa Wildlife Photo Tour. It will take me a little time to get back into my daily routine and update my readers on the latest Canon rumors, and photography news in general. One of the biggest challenges in wildlife photography is camera shake, especially when one is in a bouncy jeep, zodiac or small boat, trying to take pictures of animals. In recent years, one of the most useful advancement in digital photography is Image Stabilization (IS). Some manufacturers put that in the camera body but Canon has chosen to put it in their EF lens. Actually this is a misnomer in terminology. There is no way to stabilize an image, say a hummingbird bird in flight or a breaching whale. The animal is going to do whatever it wants to do. The only thing technology can offer the wildlife photographer is to help stabilize the camera and lens. It is more accurately to describe the technology as Camera Stabilization (CS). Camera shake is the thief of sharpness. If you are hand-holding a camera and lens, they will move as you press the shutter release. Movement during exposure blurs the image. Much of the time, you will not notice the effects of camera shake. If you are shooting with a fast shutter speed or a wide-angle lens, the blurring may not be significant− but it will still be there, and might appear if you have a big enlargement made from the image. Fortunately, Canon offers another method of reducing, if not eliminating, the effects of camera shake. Image stabilised lenses, first seen in 1995, approach the problem laterally. Rather than trying to stop the movement of a hand-held camera, they seek to introduce an opposing movement within the lens. The aim is to keep the image static on the sensor or film, despite the movement of the camera. Image stabilisation was available for camcorders long before it was introduced in EF lenses. Both electronic and optical systems were available, but size or weight constraints meant that neither was suitable for EOS cameras. So Canon went back to the drawing board and took a fresh look at the problem. The special stabilisation lens group, which is locked in a central position when not active, is released. The sensor data is passed to a microcomputer in the lens that analyses it and prepares an instruction for the special stabilisation lens group. This instruction is transmitted to the stabilisation lens group that moves at a speed and direction to counteract the camera movement. When the first EF lens with IS was introduced, it was the first time that a high speed 16-bit microcomputer had been incorporated in a lens. The computer simultaneously controls the Image Stabilizer, Ultrasonic Motor (for focusing the lens) and the electromagnetic diaphragm (for setting the lens aperture). Image stabilisation is effective with movement from 0.5Hz to 20Hz (1Hz is one movement cycle per second). This will cope not only with situations from simple camera shake (0.5Hz to 3Hz), but also the engine vibrations encountered when shooting from a moving vehicle or helicopter (10Hz to 20Hz). Power for image stabilisation lenses comes from the camera battery, so there will be fewer exposures per battery charge when an image stabilisation lens is attached to the camera and switched on. Camera shake is detected by two gyro sensors in the lens; one for yaw and one for pitch. The sensors detect both the angle and speed of the movement. With an IS lens, the gyro sensors detect the camera movement and pass the data to a microcomputer in the lens. This instructs a special group of lens elements to move at right angles to the lens axis. The amount and direction of this movement is just enough to counteract the amount and direction of the camera shake. The result is that the paths of rays of light passing through the lens are adjusted so that the image remains stationary, relative to the film or digital sensor. An enlarged section of the main image shows significant blurring from camera shake when image stabilisation is not used. The image taken with the Image Stabilizer switched on is much sharper. One problem with the first two EF lenses with IS produced is that the system regards panning as camera shake, and tries to overcome it. This causes the viewfinder image to jump about, making it difficult to see and frame the subject accurately. When panning the camera to follow a moving subject, use Mode 2, if available. This switches off the Image Stabilizer in the direction of camera movement to avoid confusing the image stabilisation system. Image stabilisation for movement at right angles to the direction of panning is not affected. IS Mode 3 was announced with the EF-300mm f/2.8L IS II USM and EF-400mm f/2.8L IS II USM lenses, and is also in the EF-400mm f/4 DO IS II USM, EF-500mm f/4L IS II USM and EF-600mm f/4L IS II USM telephoto lenses. The EF-100-400mm f/4.5-5.6L IS II USM and EF-200-400mm f/4L IS USM EXTENDER 1.4x telephoto zoom lenses also feature Mode 3. IS Mode 3 takes the benefits of standard IS (effective for both horizontal and vertical camera motion) but, instead of it being active all the time, it only activates when you fully press the shutter button to take an image. It is especially useful for sports photography where you are likely to be moving between subjects quickly. Introduced with the EF-100mm f/2.8L Macro IS USM lens, Hybrid IS takes the image stabilisation concept and applies to it to macro photography. When using longer lenses or for general purpose shooting, any camera shake appears to be rotational - i.e. an up and down or side-to-side movement around a point - that point being the camera. This is effectively corrected by the IS motors contained in the lenses. However, when you move in close for macro photography the camera shake motion appears to be less rotational and more shift based - as if the whole frame is shifting up and down or side-to-side parallel to the subject. This is what Shift IS, found in the Hybrid IS system of the EF-100mm f/2.8L Macro IS USM lens, aims to correct. How effective is image stabilisation? The earliest IS lenses give a gain of about two shutter speed steps. This means, for example, if you shoot with a shutter speed of 1/60th of a second with IS, it will be the equivalent of 1/250th of a second if you shoot without the Image Stabilizer switched on. Or if you can obtain a sharp image without image stabilisation at a shutter speed of 1/60th of a second, you will produce results of similar sharpness at 1/15th of a second with image stabilisation, other factors staying the same. One of these factors is focal length. Increasing focal length not only magnifies the subject − it also magnifies the effects of camera shake. A useful guide is that you should use a shutter speed at least equal to the reciprocal of the focal length when holding the camera and lens by hand. So if the focal length of the lens is 200mm, the shutter speed should be at least 1/200th of a second. More recent IS lenses have improved their effectiveness, giving a three-step, four-step or a five-step gain (a five-step gain is found in the EF-200mm f/2L IS USM lens). A four-step gain means that shooting with a shutter speed of 1/15th of a second with image stabilisation gives the same image sharpness as shooting at 1/250th of a second without image stabilisation. Keep in mind that image stabilisation only reduces the effect of camera shake − it has no effect on subject movement. IS lenses work with all EOS cameras, regardless of when they were introduced. The IS system − gyros, microcomputer and special lens group − is part of the lens, not the camera. However, there is some communication with the camera and there are some operational differences between the EOS SLR models. When an extender is attached to the lens, image stabilisation does not operate with the EOS 1, 10, 100, 1000-series, 5, 600, 620, 650, 700, 750, 850 and RT cameras. During a bulb (B) exposure, image stabilisation does not operate with most EOS models. It continues with the EOS 1000-series, 5, 500 and 700. It stops immediately after the exposure starts with the EOS 1, 10, 100, 600, 620, 650 and RT. In all cases, image stabilisation is unlikely to be effective with long exposures. Canon recommends that the Image Stabilizer is switched off for bulb exposures. With the EOS 3, 50, 50E, IX and IX7, image stabilisation does not work when the self-timer is used. IS lenses work well when used with accessories. Add an EF extender and you can increase the effective focal length of the lens by 1.4x or 2x. Increased focal length means that the effects of camera shake are also magnified, so the image stabilisation is very useful. EF extenders are compatible with L-series and DO lenses of focal length 135mm and greater, and a small number of wide-aperture telephoto zoom lenses. Image stabilisation also remains effective when extension tubes or close-up lenses are used. An extender can be used with many IS lenses. Image stabilisation remains effective with most recent EOS camera models. Although an IS lens gives more opportunities for hand-held shots, there will still be times when the support of a tripod is needed − with exposure times of several seconds, for example, or when working with heavy EF 500mm or EF 600mm lenses. You should also leave the Image Stabilizer on when using a monopod, as it is unlikely you will be able to keep this type of support perfectly still.